Archaeologists have named the spatially restricted cultures after the pottery which people of that culture created. 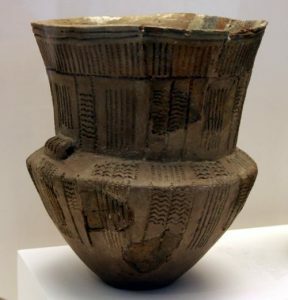 The so called Funnel beaker culture, short TRB from (German) Trichterbecherkultur (ca 4000 BC – 2700 BC) covered big parts of the North of Europe. The TRB is further sub-divided into groups and stretches from parts of the Netherlands in the West, over Northern Germany to Poland in the East. In the North it is covering Denmark and the South of Sweden.